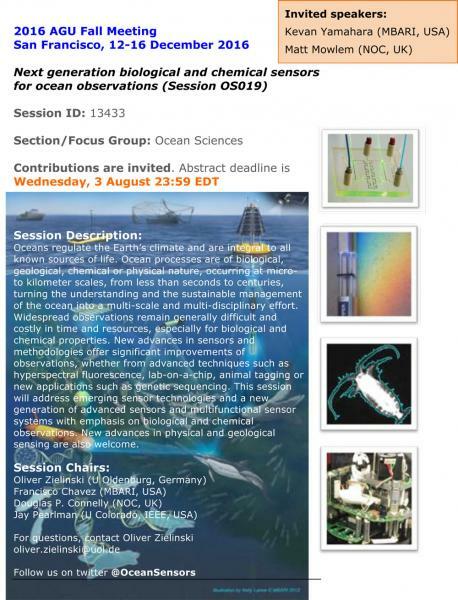 2016 AGU Fall Meeting: session on ocean observation sensors. Doug Connelly, the SenseOCEAN coordinator will co-chair a session on 'Next generation biological and chemical sensors for ocean observations' at the next AGU Fall Meeting to be held in San Francisco, USA from 12-16th December 2016. Matt Mowlem, who coordinates the 'core technologies' work within SenseOCEAN will give an invited talk. Contributions addressing emerging sensor technologies and new sensors addressing biological and chemical observations are invited, with advances in physical and geological sensing also welcome. For more details, please see the updated flyer below.